This morning while walking I noticed a European honeybee on a mustard flower. Mustard is not a native California plant, although it has become extremely widespread. On the California poppies nearby, a different kind of bee was busy, a large black bumblebee with yellow stripes. I wondered if the bee was as native as the poppy to my Northern California farm. It took some sleuthing to come up with a name for the little guy. I think it is a Yellow faced Bumble Bee, Bombus vosnesenskii, but I am not an expert. Of the 30 species of bumblebee listed at bugguide.net, this one looked the most like the ones in my photos. It is possible it is a Bombus caliginosus. I had taken a lot of photos. This particular bee does not seem to stay in one place very long, and it was quite difficult to get shots without motion blur or focusing problems. The bee is definitely native to my area. The range seems to extend from Baja California to Alaska, and as far east as the Rocky Mountains. 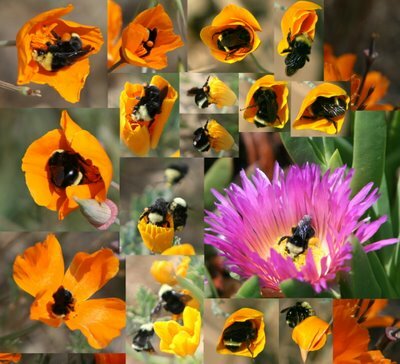 So, I had found a European bee on a European plant, and a California bee on a California plant. This got me to thinking about invasive native species, and efforts to control them. If some invasive species are mostly pollinated by bees from their home area, removing those bees might help control the pest plants. Instead of removing the weed, the flowers could be sprayed with an insecticide. Then they would no longer get pollinated, and no longer spread. Of course this kind of control has many problems associated with it. There would be collateral damage. Some native bees would be killed. People who raise honeybees for honey would probably object. And the process would be slow, as we are simply making it a little harder for the plants to crowd out the native species. But the other side of the coin is encouraging native bees by removing the competition from European honeybees. By removing non-native plants that are pollinated only by honeybees, the honeybees would go where their favorite plants are, and the native bees would have the native plants to themselves. More native bees pollinating native plants leads to more native plants. Perhaps. Keep your eyes open while you walk around your garden or past an open field. Ask yourself questions about what you see, and follow up with a little research. You never know what you’ll learn that way.